Both flagships are powered by Snapdragon 801 chipsets but, somewhat obscured in Qualcomm's naming convention, the two aren't quite the same. 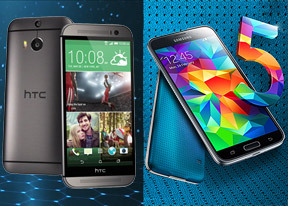 The Samsung Galaxy S5 uses the MSM8974AC variety, while the HTC One (M8) has an MSM8974AB. The difference between the base MSM8974 (Snapdragon 800) and those two are that the Adreno 330 GPU is clocked at 578MHz, up from 450MHz. The CPU is still a quad-core Krait 400, but the AC version (the one in the Galaxy S5) goes a step further and bumps the original clockspeed up from 2.3GHz to 2.5GHz. Keep in mind those rates aren't locked, that is the software can change them depending on the performance mode. For example, the battery saving modes cap the clockspeeds at lower values, while a certain infamous setting pushes them higher. We're talking, of course, about benchmark cheating. Samsung used to do it, but disabled the "feature" on all its Android 4.4 software. HTC does it on the One (M8) and claims it's a feature that can be used for more than benchmarks. We still doubt its usefulness - if the chipset gets hot, as flagship chipsets do, it will throttle itself, so this over the top performance will be short-lived. We have anti-cheat versions of two Basemark tests (OS and X) to try and see what kind of difference it makes. Anyway, let's start with the basics. CPU benchmarks randomly place the Galaxy S5 behind and ahead of Snapdragon 800 devices from last year. The HTC One (M8) lags behind them for the most part, by quite a bit in Geekbench 3. We ran Basemark OS - the regular version and a modified anti-cheat APK - and found out that the CPU score differs 12% and 17% respectively for single and multi-core performance on the HTC One (M8). This means the Geekbench is closer to reality than Benchmark Pi and Linpack. We go to AnTuTu 4 and Quadrant for an overall look at performance. Here both flagships are pretty evenly matched, but again the One (M8) temporarily boosts performance for a short period of time (just enough to run a benchmark). When it comes to 3D benchmarks it should be noted that both phones have 1080p screens, but the HTC One (M8) reserves a sliver of that for the on-screen buttons. This should give it a small advantage in on-screen tests. Indeed, we see that the off-screen performance is quite close between the two (as can be expected, given the identical GPUs), except the One (M8) gets a minor bump going from offscreen to on-screen in both GFX benchmarks (2.7 and 3.0). Anyway, both phones top the charts as can be expected from Adreno 330 at a higher clockspeed than last year's models. So it comes as a slight surprise when the Galaxy S5 lags 5fps behind the HTC One (M8) in Epic Citadel. The difference is too big to explain with just on-screen buttons. Next we tried Basemark X using an untouched APK and a modified one to dodge benchmark detection. The HTC One (M8) beat the Galaxy S5 running both versions, but each phone shows no difference in performance on either version of Basemark X. This means that the M8 benchmark cheating is limited to CPU overclocking. The two flagships are quite close in terms of performance. The Samsung Galaxy S5 can be expected to go faster where CPU is concerned, especially in multi-core scenarios (e.g. using two apps simultaneously). The faster CPU and perhaps some software tweaks helped the Galaxy S5 pull ahead in web browsing performance too. 3D games shouldn't show much of a difference between the two phones, however. Winner: Samsung Galaxy S5. Having a bit more CPU oomph, which in turned boosted web performance, give this victory to the S5. It's a narrow victory as the One (M8) held its own in 3D gaming and is still one of the fastest phones around.